King Solomon’s views on the importance of knowledge and wisdom, and the wise counsel that provides those things, weave throughout the entire Book of Proverbs – and his words hold truth for every generation. But as we’ve noted before in this space, the escalating costs of wisdom are creating an economic crisis, as new college graduates leave school with massive amounts of debt. 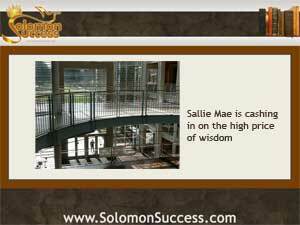 Now, as student loan megalender SLM Corp (familiarly known as Sallie Mae) prepares to split into two separate agencies so it can devote more resources to servicing the lucrative private student loan market, industry watchers see some disturbing parallels to the conditions that led up to the housing crash. Before the housing crash, borrowing for home purchases was easy and prices were high – a combination that lured many homeowners into taking on the debt of mortgages they couldn’t manage, That caused the massive wave of foreclosures and short sales that left the housing market reeling. Something similar has been happening in the student loan industry. As tuition rates began to climb at virtually all institutions, student loans were offered not just by industry leader Sallie Mae but many other lenders, to virtually every student who applied. Like subprime mortgages, student loans were offered on deferred or interest-only payment planes, or tied to borrowers’ post-graduation income. With college costs hopelessly out of control, degree seekers were led to believe that taking out student loans was the only option. And now, as tuition costs continue to rise, the private loan market is expanding too, promising to cover costs that federally funded student loans don’t – at interest rates and terms that are often far higher than those on traditional loans. The upward spiral of college costs and loan amounts leads some financial experts to fear a bubble is about to burst, just like the housing bubble did. And that’s why Sallie Mae’s move to create an entity capable of servicing more lucrative private loans to unwary students and their families is cause for concern. Like the housing collapse before it, the student loan collapse would have a ripple effect throughout many other areas of the economy. As we’ve noted in previous posts on the reasons investors should watch the student loan issue, recent grads saddled with massive debt don’t buy homes, or take out loans for other reasons Many can’t get work in their degree fields and, unable to pay down their loans, end up defaulting, ruining the credit needed to apply for a mortgage. And cash-strapped students become renters who may default on rent too, leaving landlord/investor empty handed. For many students, federally funded student loans are a lifeline to higher education. With lower interest rates and deferred payment options, they’re relatively affordable and safe, unlike private loans that may set students up for failure later.